While the idea of Bus Rapid Transit has merit, its implementation in Pune has created a poor first impression. Inadequate planning, lack of enforcement of dedicated lanes for buses, and haste in rolling out the project have all been criticised, and experts find much room for improvement. Vinita Deshmukh reports. Pune's reputation as one of country's top New Economy centres has been severely marred thanks to its crumbling infrastructure, especially the sorry state of its public transport. While flyovers and widening roads have been undertaken by the Pune Municipal Corporation (PMC) and the Maharashtra State Road Development Corporation (MSRDC) with enthusiasm to fight traffic congestion, the relentless addition of vehicles, fueled in part by a rapidly growing migrant population drawn to Pune's information technology companies, its automotive plants and educational institutions, has rendered most efforts to augment the road network obsolete even before they are complete. The great hope for all urban traffic nightmares is public transport, but on this front too there is little cheer. The Pune Municipal Transport (PMT) is in a sorry condition, with an inadequate 900-odd fleet, and 50 per cent of the buses are more than 10 years old, resulting in nearly 15 per cent of the fleet being inoperable on any given day. To make matters worse, infrequent service in many areas, bad maintenance of the buses, and the citizen-unfriendly image of the PMT all steer away many residents, who have turned - with no alternative - to private transport. Around one lakh vehicles have been registered annually for the last few years; the city, with a population of around 30 lakhs, has nearly 14 lakh vehicles, 70 per cent of which are two-wheelers. As private vehicle ownership continues to rise, and with no significant alternatives for public transport, the already weak infrastructures deteriorates a little each day. Over the last few years, various bombastic solutions have been declared for solving Pune's traffic problem - the questionable 'sky bus' being the pet one. Although the project has not been granted a safety certificate by the Indian railway authorities, the proposal to launch it has been recently revived. The creation of a 'ring road' to wean away inter-state heavy traffic that now courses through the city, and strengthening the PMT, are two other plans that have been repeatedly drummed into citizens' ears like election promises, never to be fulfilled. While there's a whiff in the air about a possible Metro network for Pune - another white elephant offered to citizens who have now become cynical and are unimpressed - one other plan has recently become a reality. Bus Rapid Transit (BRT) has arrived in the city. In recent years, BRT has gained considerable respect around the world as a practical and affordable choice for mass urban transport. It is akin to a mass bus network on the road surface on the lines of a local rail network, where pre-ticketing, wider and lower floors, high frequency and efficiency cut precious commuting time and give breathing space to the roads and parking areas which become bereft of private vehicular congestion. It is also a comprehensive system wherein cycling and pedestrian paths make the roads more people-oriented. Picture: A bus plying on the BRT track on the Hadapsar-Swargate-Katraj corridor has pedestrians and non-BRT traffic encroaching on its track. The arrival of BRT in Pune has itself been rapid. 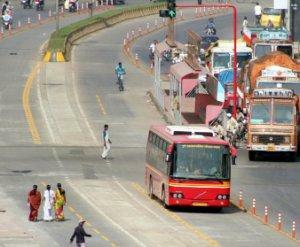 While the BRT system, which envisages dedicated lanes for the quick navigation of buses amidst other traffic, is being worked out for Ahmedabad and Delhi, Pune has become the first city to implement it. The pilot project is currently underway along the Hadapsar-Swargate-Katraj corridor and the Solapur-Bhairoba Nallah stretch - both of which are a part of the state highways that run through the city. The ambitious plan over the next few years is to have a whopping 100 kilometres of BRT network. The work on the first phase will cost Rs.65 crores, and be funded by the Jawaharlal Nehru National Urban Renewal Mission of the central government. The concept of BRT is an ideal one for cities like Pune, says environmentalist and traffic expert Sujit Patwardhan, whose well-respected NGO, Pune's Traffic and Transportation Forum (PTTF) has been campaigning for enhancing a mass public transport system to discourage the usage of private vehicles. He explains, "Firstly, it is so much easier to implement than Metro rail or a skybus, and secondly, compared to the Metro which costs around Rs.175 crores per km, BRT in Pune would cost Rs.6-10 crores per km, and even this includes procurement of the required buses." But while the idea may have merit, its implementation has created a poor first impression. PMT has come under fire for rolling out the service without proper planning or alertness to the problems of implementation. The eagerness to have a minister inaugurate it last fortnight and make it partially operational - five Volvo buses have already begun plying on a 4 km stretch - left some citizens wondering if civic elections due in early February this year were a factor in the timing of the launch. As per the city's Development Plan, 13 per cent of the land should be ideally earmarked for transportation and circulation. In reality, it accounts for a pathetic 4.46 per cent. Operational problems too have been plentiful. The traffic police have not adequately enforced the dedicated lanes for the buses, and encroachment on to the paths by other vehicles. The number of vehicles allotted to the BRT pilot has also been inadequate. Patwardhan is cynically critical of the rollout. "If this is a pilot project, the citizens should be able to see for themselves why it is better than any other public transport. Quick frequency of good-looking buses would lure the citizens to accept this mode of transport, but the PMC instead has bought just five buses, so the impact quotient is very less. Since citizen perception is the key element to the success of this story, the lack of willingness to make it work by the PMC may result in this good alternative failing. It is almost as if a conspiracy is being hatched to make BRT fail by slip-shod implementation so that other exorbitant and unviable projects are brought in." Traffic and transportation experts, as well as city activists are crying themselves hoarse over the poor implementation. The PMC has allegedly not adhered to the guidelines laid out by the IIT Delhi, which in its advisory capacity has made several recommendations. PMC has not engaged a project consultant to liason with IIT Delhi. The result? Work on the BRT has begun without micro-planning or a Detailed Project Report; devoid of traffic and transport experience, the city has simply rolled out the idea and rushed headlong into predictable failure. Planning is essential to anchor such a system, notes Venkat Rao Pindiprolu, a transport expert who has been with the US Federal Transit Administration (FTA) for nearly 14 years (FTA is part of the US Department of Transport and evaluates Transit Proposals submitted by cities for Federal Funding and has been promoting BRT as an economically viable solution). He has been closely watching the proceedings of Pune's BRT. Dismissing it as just a "marginally modified bus service" during his recent trip to Pune, Venkat states that Pune's pilot project does not merit being called a rapid transit system. "Personally, I would have liked to see a high-end BRT on multiple dedicated lanes to facilitate express and local service, with supporting systems - fare collection off board vehicles, level boarding, multiple doors for ease of boarding and alighting, priority at intersections to reduce waiting times, non-polluting propulsion, and other measures that discourage use of automobiles. This pilot is only a start, and can be improved upon", he says. Prashant Inamdar, a civic activist who has obtained several details of the BRT under the Right To Information Act, finds much that is wrong. "No sanctity or seriousness has been put to work.. The selection of the corridor is wrong - being part of state highways, there's already congestion of heavy vehicles from other cities. No detailed traffic survey has been carried out, a pre-requisite for any success. You have a very busy State Transport bus station, with one bus entering or exiting every minute; this will clash with the BRT lane. No comprehensive thought has been given to the inter-connecting feeder service either, in the absence of which a commuter would think twice before using the BRT buses. What does he do if the BRT service leads him halfway to his destination? The PMT should be the back-up to complete his journey. If it doesn't he would rather opt for his personal vehicle." P G Patankar, a senior traffic transportation expert, pooh-poohs the whole idea of a BRT for Pune. Says he, "How can Bus Rapid Transit apply to a congested city like Pune? If it has worked in South America - [Eds. note: the most successful examples are from Brazil and Colombia] - it is because the density of population is lower compared to our cities, and roads there are as wide as our expressways so you can have dedicated bus lanes without disrupting other traffic. It would be better to ncrease the efficiency and frequency of the present PMT fleet. That would not require a dedicated lane - a luxury for our congested cities. What we require is point-to-point buses at higher frequencies. The BRT experiment is sure to fail." That view, if true, would be an important lesson for dozens of cities in the country now facing growing traffic problems, and looking for ways out. BRT has gained some acceptance among decision-makers, and the roll-out in Pune and Ahmedabad will be keenly watched. Better implementation in these cities that are pioneering the idea in India would help others judge the pros and cons of BRT on its own merits, rather than on the efficiency of Pune's administration. The PMC believes it is on the right track, the early problems notwithstanding. Whether it can right itself in time for BRT to gain a strong foothold in the city remains to be seen.